I hope you're ready to be inspired - because these real life farmhouse bathrooms are simply amazing! Click "next" to scan through some stunning farmhouse bathroom inspiration from some of my most favorite bloggers. If you like this post, please pin it here to share with others & save for later. These bathrooms are all so inspiring – and each of them are helping to inspire our own bathroom renovation! Subscribe to my newsletter at the bottom of this post so you can stay updated on our bathroom’s progress. 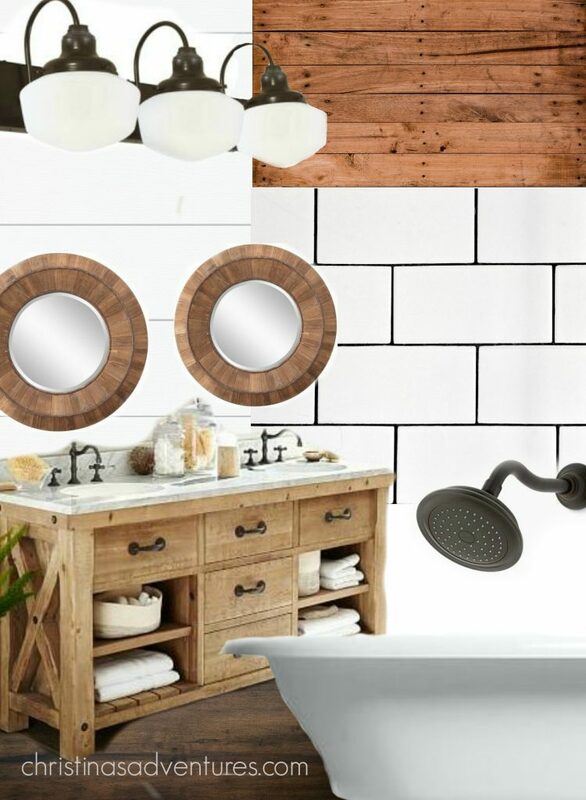 Make sure you see this post about our farmhouse bathroom design board so you can see the vision we have for the space. If you like this post, make sure to pin this image and share the inspiration with others! Absolutely stunning! Thanks for sharing, I need to save this as we continue to renovate our home! So much gorgeous inspiration! Bathroom renovations are in our future, and these are all gorgeous photos. I especially love the cement tiles from Wife in Progress. The light tone is great way to incorporate a trendy design in a way that will last more than a few years.